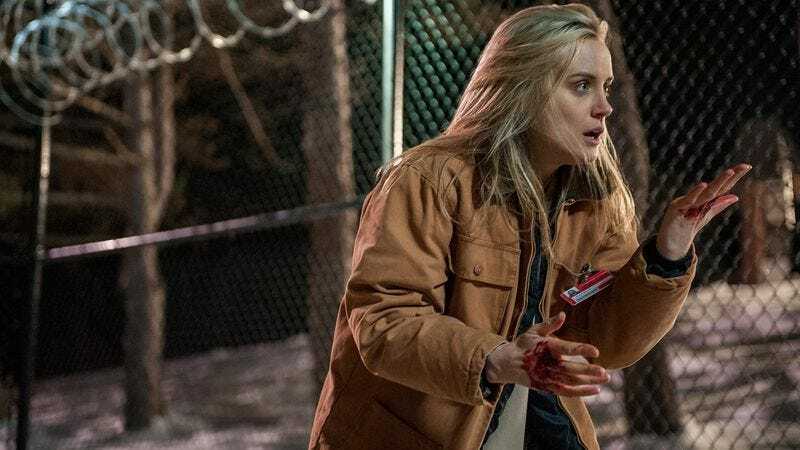 Netflix has released three images from the upcoming second season of Orange Is The New Black, and obsessive fans are sure to pick them over for subtle visual clues—after all, the Internet needs something to do now that True Detective is done for the year. The image above is the only one of the batch that depicts Taylor Schilling’s character, Piper Chapman, and her absence from the other pictures may be an indication of Orange’s more ensemble-oriented approach in its second year. Also note the substance on Piper’s hands, which at first appears to be blood. But look closer and you’ll see the telltale thickness of sloppy joe sauce—the same sloppy joe sauce used at certain Christian charter schools in Louisiana where missing-child cases proliferated in the 1980s. Conclusion: Piper Chapman is the Yellow King. The second photo depicts series regular Kate Mulgrew (left) with Lorraine Toussaint, a new addition to the cast. Toussaint’s character is staring down Red, which suggests that the former head chef may have a new rival. But let’s zoom in for a closer look and note the first four digits on Toussaint’s ID badge: 1973, the same year that Billy Lee Tuttle founded his evangelical organization. Conclusion: Lorraine Toussaint’s character is the Yellow King. In the final photo, some sort of fair is taking place—perhaps a job fair, although this may only be a mock job fair. The viewer’s eye is naturally drawn to the glitz of Laverne Cox’s shimmery outfit on the far right, but shift your gaze to the left and you’ll see Emma Myles decked out in yellow. Conclusion: Laverne Cox looks great in sequins.